George and Margaret Musgrave's second child Emma was born at Shillington Manor Bedfordshire in 1795. In 1831 Emma Musgrave married James Higham at Shillington Parish Church. James and Emma's first child Henrietta Margaret Higham was born 11th February 1832 and baptised at the Parish Church of St George Bloomsbury on 22nd February 1832. Above is the Baptism certificate for James and Emma's second child Emily Matilda Higham who was born 8th March 1833 and baptised 20th April. James and Emma's third and last child George Lascelles Higham was born 26th September 1834 and baptised 23rd December. (9), Emily (8) and George (6). They have 4 servants liing in. 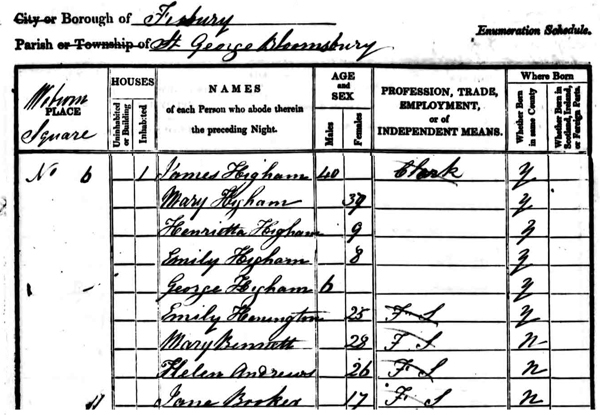 The 1851 census extract above for 6 Woburn Square lists James and Higham living with just their son George. Both daughters Henrietta and Emily were staying with relatives, the Lascelles family in Amersham Bucks at this time. Emma's husband James died around 1859/60. The 1861 census shown below lists Emma Higham now living with her son George (26} and daughter Henrietta (29). They are living at 13 Blomfield Terrace Harrow Road Paddington. Emma's other daughter Emily Matilda Higham was away from home visiting relatives the Lascelles family now living in Leckhampton. George Lacelles Higham married Eliza Gilbertson on 5th September 1861 at St Saviours Paddington. The certificate above shows that he was employed by the government working for their Office of Woods and Forest. George and Eliza's first child Amy Florence Mary Higham was born 7th December 1861 and baptised 30th April 1862 in Ealing. George and Eliza's second child Herbert Lascelles Higham was born 28th May 1863 and baptised at Holy Trinity Twickenham 24th June 1863. The family were now living at North Villa Belmont Road Twickenham Common. Their next Child Fanny Howard Higham was baptised 17th August 1864. In 1866 their next child Annie Catherine Higham was born. Unfortunately both children died late in 1870. George and Eliza's daughter Gertrude Mabel Higham was baptised 3rd June 1868. The family were now living in St Nicholas Road Upper Tooting, Surrey. George and Eliza's next child Reginald George Higham was born 1st Jan 1871and baptised at Holy Trinity Upper Chelsea on 17th March. The family's abode is shown as 84 Sloane Street Chelsea. The April 1871 census records the family living at 42 Eversfield Place on the seafront at Hastings. The family comprises George (36), his wife Eliza (39), and their children Amy (9), Herbert (7), Gertrude (2) and Reginald (under 4 months). Also in the household were 2 domestic nurses and 1 domestic maid. George Lascelles Higham's mother Emma died 13th February 1869. she was living at 18 Cobham Villas Greenhithe Kent. Emma Higham's daughter Emily Matilda Higham had married Edward William Briscoe 23rd June 1864 in St Marylebone. The certificate below shows her reidence as Swanscombe Kent, a short distance from Greenhithe. George Lacelles Higham's wife Eliza died in 1880 at Hastings Sussex aged 48. The census extract shown below from 1881 shows the Higham family having returned to London and living in Paddington they are listed as living at a lodging house at 44 Eastbourne Terrace. The Higham family comprises George (45) widower, and children Amy (18). Herbert (17), Gertrude (12), Reginald (10), and last born son Arthur Sydney Higham (7). There is now just 1 servant employed as a nursemaid by the family. In 1882 George Lascelles Higham married Sarah Goldsmith in Elham Kent. They had just one child George Frederick Lascelles Higham born in Paddington in 1885 and died in 1958 in Folkestone. George Lascelles Higham died 7th December 1894. The probate index extract above shows his address as Winnfield, Grassington Road Eastbourne Sussex. Sarah lived until 1933 when she died 15th January at 92 Cheriton Road Folkstone. Probate was issued to her only son George Frederick Lacelles Higham.